Dr. Justin Mandel, DOM AP LAC is the medical director of the Center for Upper Back Pain Relief. He’s a Florida based Doctor of Oriental Medicine and primary health care provider. He’s also an acupuncture physician. In New York he holds a license to practice acupuncture. He has treated and/or examined over 10,000 pain patients. He’s performed tens of thousands of treatments since his first internship in 1997. Dr. Justin is currently the #1 most viewed upper back pain specialist online. He offers the largest video library of upper back pain case studies that can be found anywhere online. 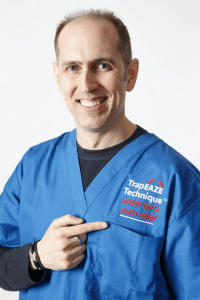 Besides to the TrapEAZE Technique® he’s invented other treatments and medical devices. He’s the inventor of the patented Bladder RE-EXPANSION Technique for Overactive Bladder (OAB). After their review Harvard fascinatingly called it “intriguing”. He’s the co-developer of the award winning Freedom Belt for post surgical fluid drainage. During his free time he enjoys traveling and outdoor activities like skiing, hiking, camping, and surfing. He’s also an animal lover, and especially loves dogs and horses.